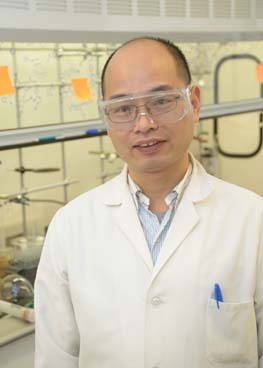 Jian-kang (Jack) Jiang is a research scientist and medicinal chemist at NCATS. His main research interest is in developing small molecules with drug-like properties through organic synthesis and absorption, distribution, metabolism and excretion (ADME) studies. Jiang developed the first human pyruvate kinase isoform M2 activator (TEPP-46) that demonstrated in vivo efficacy in a mouse xenograft model as an anticancer agent. He also is the lead inventor of a novel class of aIIbb3 integrin receptor antagonists that culminated in the discovery of RUC-4, a small molecule currently undergoing studies toward an Investigational New Drug (IND) application with the Food and Drug Administration (FDA). Jiang spearheaded the process chemistry development of RUC-4 for future manufacturing. Jiang earned his Ph.D. in organic chemistry from the Shanghai Institute of Organic Chemistry in 2002. He carried out postdoctoral research in the Laboratory of Bioorganic Chemistry at the National Institute of Diabetes and Digestive and Kidney Diseases from 2003 to 2007. In 2007, he joined the NIH Chemical Genomics Center at the National Human Genome Research Institute, now called the NCATS Chemical Genomics Center, where he worked for the molecular probe development program. Discovery of 3-(4-sulfamoylnaphthyl)pyrazolo[1,5-a]pyrimidines as potent and selective ALK2 inhibitors. ATF4 Gene Network Mediates Cellular Response to the Anticancer PAD Inhibitor YW3-56 in Triple-Negative Breast Cancer Cells. Hydroxylated tropolones inhibit hepatitis B virus replication by blocking viral ribonuclease H activity. RUC-4: a novel αIIbβ3 antagonist for prehospital therapy of myocardial infarction.